One of our customers recently asked, "What is the best way to grow T. pamelae ?" T. pamelae, (yes, this one was named after me), like many large, tank type tillandsias is a saxicoluos species. This means that it is found growing on rocks. What you may not realize is that these larger tank type tillandsias, (T. pamelae, T. grandis, T. rauhii, etc.) are using their roots to anchor to the rocks faces. Their roots will enter crevices in the rocks and fix them securely to the steep cliffs. It can be very difficult to detach them once they are established. Mature specimens have been attached up to 15 - 20 years! The rocks not only provide reflective warmth from the sunlight, but also are a source of moisture. So what is the best way to grow these. They can be grown bare root, either in a wire basket or just setting in a dry pot. But they grow slowly in this manner and as the plant gets larger it is difficult to keep it upright. They do best potted in a well draining mix with some organic material. The plants grow quicker as they are positioned securely in the pot. Another benefit is you do not get as much lower leaf die back. This is true for most tillandisas that are potted. Many people believe that T.pamelae is monocarpic, meaning that it does not pup. This is not true! T. pamelae, does pup, but usually makes only one or two pups after blooming. 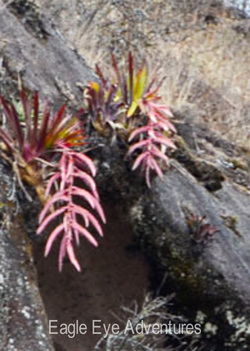 The best way to propagate T. pamelae is by harvesting the adventitious offsets. These are tiny hair pups that are produced at the base of the plant and appear long before the plant blooms. They can be harvested when they are about 2-3 inches tall. Pot them into small 2 inch pots, and as they get larger increase the pot size. They will eventually grow to maturity and bloom. T. pamelae is a beautiful and spectacular species to see in habitat. The semi succulent vase shaped rosette is can be two feet plus tall. It's pendent spikes are 5-6 feet in length and can hold color for more than 1 year. 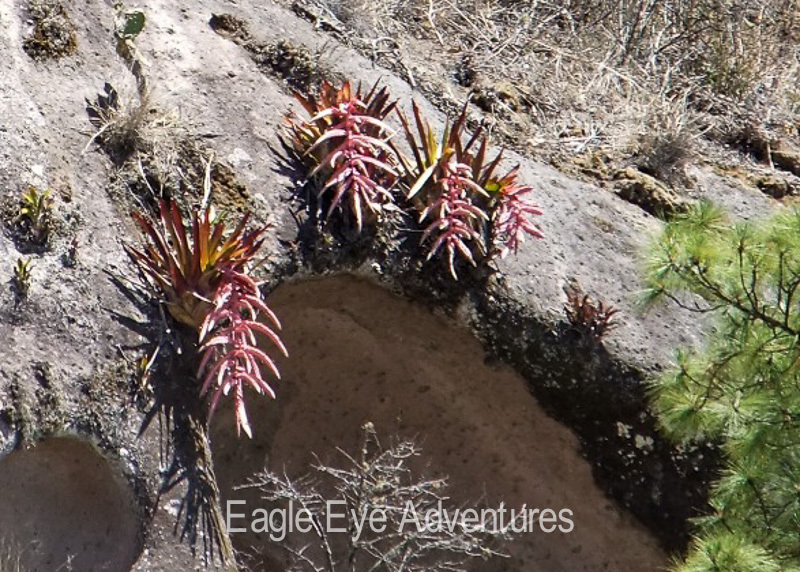 Check out this article published in The Leaflet, Vallarta Botanical Gardens publication, written by San Diego Bromeliad Society member, Andy Siekkinen.